The Dunwoody High School Art department is hosting a fun craft day for kids from age 3 to age 11 on Saturday, March 11th from 11 a.m. till 3 p.m.! We will be creating all kinds of fun arts and crafts as well as playing a few games! It will be $25 per child. ***We will need at least 10 kids signed up by the March 2nd in order to host this event. If we do not get this many sign ups we will provide you with a full refund. Dunwoody's All Saints Community Fish Fry starts Wednesday at 5 pm. 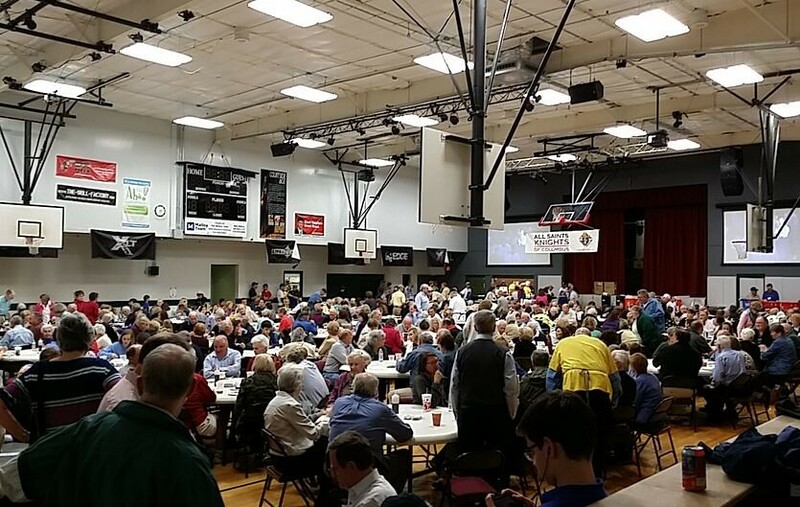 They served over 8,000 meals in 7 nights last year. Come see what you are missing! My family attends All Saint's Catholic Church and I'm a member of the Knights of Columbus, a fraternal service organization dedicated to providing charitable services. 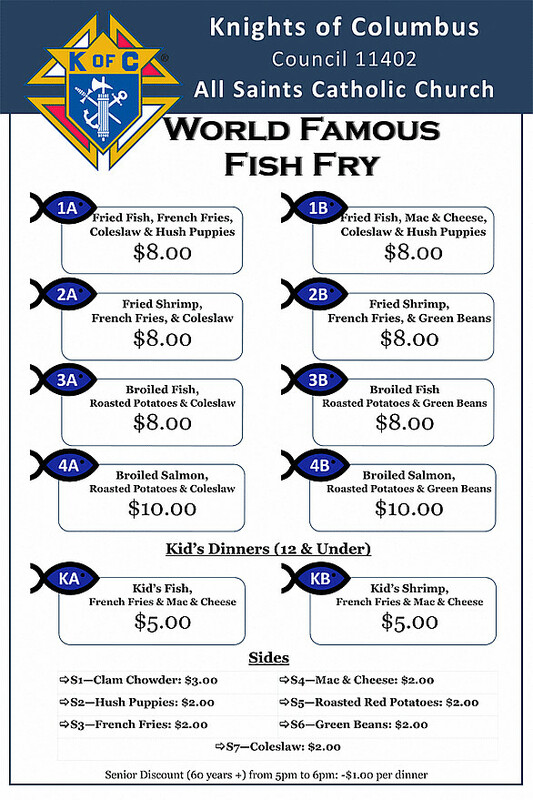 The Knights biggest fundraising event is our “WORLD FAMOUS” FISH FRY which starts Wednesday evening and continues for six consecutive Friday nights with the last serving occurring on Friday, April 7th. Fridays, March 3, 10, 17, 24, 31, and April 7. No Fry on Good Friday, April 14. Menu: fried fish, fried shrimp, broiled fish, broiled salmon, french fries, roasted potatoes, macaroni and cheese, green beans, coleslaw, hush puppies, clam chowder. We again will be the accepting of credit cards -- Visa, Mastercard, American Express, and Discover. We hope this will speed up the waiting lines and be a big convenience to our customers. Cash and personal checks still work and are preferred. The parking spots near the gym will be reserved for take-out patrons, the elderly and infirm who can’t walk far. Below is a menu and I hope to see you there as it is quite a community social gathering. Update From State Representative Tom Taylor - HR 58 independent school systems. Approval of an Intergovernmental Agreement with DeKalb County for Infrastructure Projects. Approval of a Contract Amendment with Optech for Parks and Right of Way Maintenance. Resolution Appointing Members to the Volunteer Coordinating Committee. Watch Live at 8:00 a.m.
Heneghan comment - The Dunwoody City Council set the hotel tax rate of 5% back in 2009 and raising it has not been discussed previously. 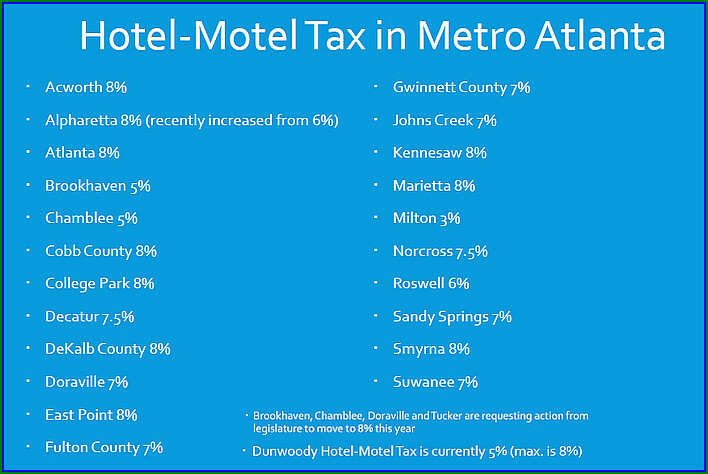 Other nearby cities are about to offer a bill in the state legislature to raise their hotel tax rate and our hoteliers along with the Dunwoody Convention & Visitors Bureau are favorable of the rate increase here in Dunwoody. I believe the reason for this special meeting was to pass this reolution to make a state legislature deadline to be added to a tax increase bill being drafted for other cities. Neither this act or the act of the state will raise the taxes but both together would allow us to come back and set the final rate if appropriate and projects are tied to the revenue. To approve a resolution requesting state to allow Council to vote for authorization to increase the City’s hotel tax rate to an amount not to exceed 8%. Presently, the City has a 5% hotel excise tax for the room and authorized related charges. For 2016, each percent yielded tax revenues of $533,837 to be used as required by state law. Dunwoody may levy and collect an excise tax of a rate of up to 3 percent or at a rate of 5,6,7 or 8 percent on charges made for rooms, lodging or accommodations furnished by our hotels. Under state law, Dunwoody may do so only after the passage of local legislation authorizing the tax. As an initial step, after consulting with relevant destination marketing organizations, hotel owners, and others in the tourism industry, any city considering an increase in its tax rate will adopt a resolution stating the proposed new hotel-motel tax rate, the allocation of proceeds, and the projects, if any, that will be funded by the tax. This resolution does not set Dunwoody’s tax rate. Neither will the state legislation being requested by the resolution. It merely adds a tool to the tool chest that allows Council to consider and subsequently adopt an appropriate amount to be used in accordance with state law. That rate and use will be vetted and considered at a later time; allowing vested parties to participate in the process to both set the rate and identify the usage. Under the new process, the city is required to spend the tax revenues that would be collected at the rate of 5 percent in accordance with the general 5 percent tax rate authorized in O.C.G.A. § 48-13-51(a)(3). At least half of the tax revenues collected in excess of amounts that would be collected at the rate of 5 percent are required to be spent through a contract with a destination marketing organization (CVBD) for purposes of promoting tourism, trade shows and conventions. The remaining revenues, if any, collected in excess of amounts that would be collected at the rate of 5 percent are required to be spent for tourism product development. Council may choose to reject or postpone the resolution. Such action will prevent the legislation from being adopted at the state level due to deadlines for advertising and consideration by state representatives. Staff recommends the Council approve the resolution asking the state to authorize the City to adopt a hotel tax rate not to exceed 8% to be used in accordance with state law. Administer Oath of Office to Officer Kevin Lopez-Licona. 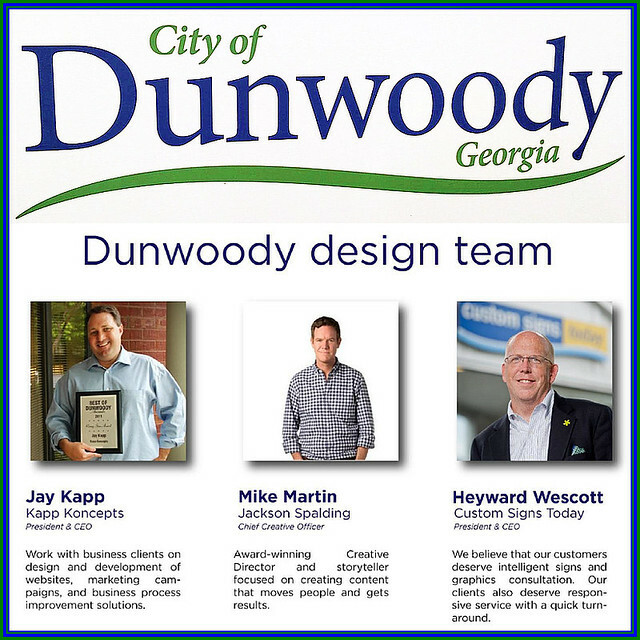 Convention & Visitors Bureau of Dunwoody Year in Review. INC, owner of 5465 Chamblee Dunwoody Road, Dunwoody, GA 30338, seeks the followingSpecial Land Use Permits from Chapter 27: a.) Section 27-97(g)(1) to exceed the maximum allowed parking in the Dunwoody Village Overlay District; b.) Section 27-97(i)(3) to reduce the pedestrian zone along the abutting sides and rear of the building; and c.) Section 27-97(k)(1)(a) to reduce the pedestrian “build to zone” requirement. Resolution Appointing a Member to Serve on the Sustainability Committee. Resolution Appointing Members to Serve on the Volunteer Coordinating Committee. Lease Termination Agreement for Atlanta Communities Real Estate Brokerage, L.L.C. 4800Ashford Dunwoody Road, Suite 200. Construction Funding Authorization for Winters Chapel Road Sidewalk. Construction Funding Authorization for the Olde Village Lane Sidewalk. Design Contract Amendment for Chamblee Dunwoody Road at Spalding Road Intersection Project. Georgetown Gateway Non-reimbursable Contract for Acquisition of Right of Way with Georgia DOT. Contract Approval with Taylor Morrison Homes for the Dunwoody Trailway Bridge Abutment Construction. SECOND READ: Text Amendment to Chapter 27, Section 27-97, DVO, Dunwoody Village Overlay. FIRST READ: Text Amendment to Chapter 18, Noise - Administrative Exemption. Approval of MOU for Traffic Control. 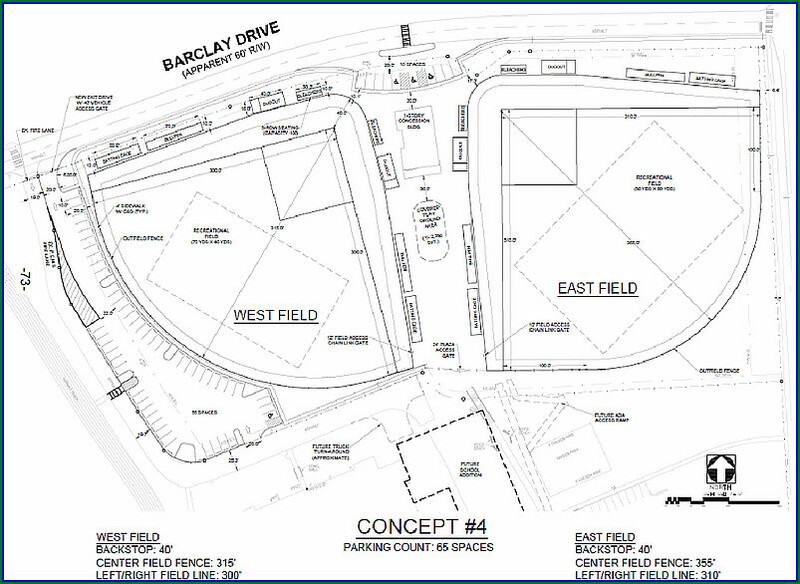 The Dunwoody City Council was notified that all interested parties (PCMS, Dunwoody Senior Baseball & City Staff) have agreed to the following layout of two baseball fields with artificial turf. Questions were raised regarding trying to save the tree line along North Peachtree Road as much as possible especially near Barclay as the fences seem very close to the sidewalks. Staff will be looking at options to save the tree line. Dunwoody City Hall Layout and Construction Update. Items of interest that have crossed my Dunwoody City Council desk. 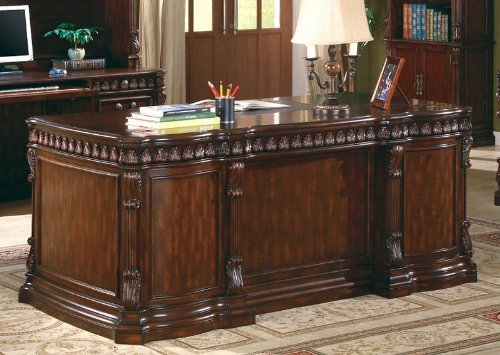 "Not my real desk, as I work behind makeshift folding tables in my basement." The City of Dunwoody is holding a two-day retreat planning meeting on Thursday & Friday in an old farmhouse in Sandy Springs as it might inspire us to see what the Donaldson-Bannister house could be someday. The agenda is sparse and documentation is light but if I get more on Wednesday I will post. 1. DRAC responsibility in the Dunwoody Village Overlay. 2. The applicability of the residential infill (contextual regulations). Dunwoody Project-Program Activity Update - City staff and departments are actively managing ongoing projects, programs, and initiatives throughout Dunwoody. From infrastructure improvements to construction projects and departmental efficiency measures, staff is focused on strategic coordination and management. Following is a high-level, bulleted summary of key activities from the past several weeks and being coordinated over the weeks ahead. 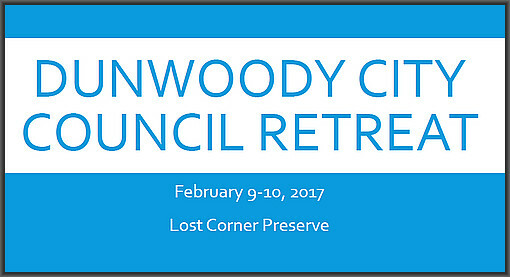 Dunwoody High School Student City Council conducts park survey and possible plans for Austin Site. RFP 17-02 Dunwoody Green Commercial Site Development - The Dunwoody Urban Redevelopment Agency (URA) hereby solicits invitations from qualified developers to submit proposals to partner with the URA and the City of Dunwoody for development of approximately 2.5 acres pf property at 4600 North Shallowford Road at the intersection of North Shallowford Road and Dunwoody Park. The property is located within the City's designated Urban Redevelopment District. Dunwoody, Georgia has been selected to participate in the National Health and Nutrition Examination Survey (NHANES), a major study of the health of persons living in the United States. The National Center for Health Statistics, part of the Centers for Disease Control and Prevention, is conducting the door to door study to do household interviews and standardized medical examinations in a mobile examination center. Dunwoody Police is aware and they do not need City permits. James Dwyer is a Dunwoody stud, a cross country legend and my neighbor who now works at the Southern Company to bring green energy products to Atlanta. Wrap your head around this... in 2016, the City of Dunwoody had close to 2,300 open records requests. We also have a position available to be our Records Clerk so if you are interested, please apply. 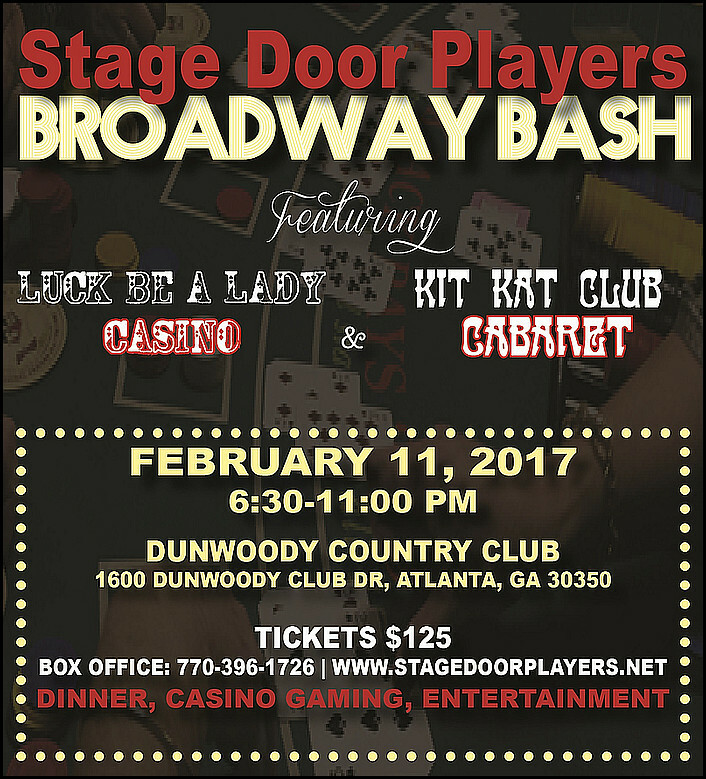 Tickets are still available by calling the Box Office 770-396-1726 and if you are going please bring cash for the bar & 50/50 as there is no ATM on site.